Pacific Symphony Youth Ensembles (PSYE) is one of the largest pre-professional musical training programs in the nation, nurturing and inspiring young musicians in grades 6 through 12. PSYE provides members with high-quality and innovative artistic experiences, which strive to encourage musical development, personal growth and lifelong learning through the art of classical performance. The program is comprised of three performing ensembles (Pacific Symphony Youth Orchestra, Pacific Symphony Youth Wind Ensemble and Pacific Symphony Santiago Strings), all of which are united by the artistic vision of Pacific Symphony Music Director Carl St.Clair. Each ensemble focuses on advancing student musicianship in a nurturing environment through professional repertoire and unique performance experiences. Students enjoy clinics with Music Director St.Clair, regular coaching sessions with Pacific Symphony professional musicians, and interactions with world-renowned guest artists such as Yo-Yo Ma, Cho-Liang Lin, Narong Prangcharoen, Derrick Spiva, Jr., and many more. 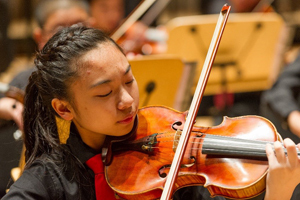 Pacific Symphony Youth Ensembles primarily perform in the world-class Renée and Henry Segerstrom Concert Hall in Costa Mesa and in various community venues across Orange County. These well-received performances are free to the public, are often sold out and touch the lives of thousands of Southern California residents. Membership in PSYE is determined by an annual audition process, attracting an astonishing 560 candidates for the 2018-19 season. The 252 students who are current members of the Youth Ensembles program represent 75 school music programs in and around Orange County. Most if not all of PSYE’s graduates pursue higher education, attending such notable institutions as The Juilliard School, Johns Hopkins University/Peabody Institute, Harvard University, Brown University, UCLA and many more. Pacific Symphony Santiago Strings is led by Music Director Irene Kroesen and provides string musicians in grades 6 through 9 with quality string training and performance instruction. Pacific Symphony Youth Wind Ensemble is led by Music Director Dr. Gregory X. Whitmore and provides wind and percussion musicians in grades 8 through 12 the opportunity to refine their skills in an innovative, and technically advanced wind symphony environment. 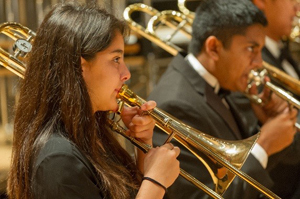 Pacific Symphony Youth Orchestra is led by Music Director and Pacific Symphony Associate Conductor Roger Kalia and provides 100+ string, wind and percussion musicians in grades 9 through 12 with intense orchestral training. For more information about PSYE, please contact our office at psye@pacificsymphony.org.